Review in Touchstone October 2018 by Rev Dr Lynne Wall. “If you have ever thought about becoming a worship leader or a lay preacher, this book is an excellent starting point. Rosalie Sugrue is a competent lay preacher of many years’ standing, who in this book has generously shared from her own treasure trove of experience, wisdom and creative resources. In the first part of her book, Rosalie introduces the reader to the Bible by providing basic information about content, characters and concepts in both testaments. There is enough to stimulate the mind and encourage further exploration by referring to the up-to-date bibliography at the end of the book. 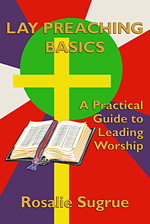 The author then moves to the nitty-gritty of how to plan a service of worship, giving general outlines and practical tips along the way. There are examples of orders of service, sermon outlines and pointers on presentation. But this is not just a ‘how-to’ book. Rosalie reminds the would-be worship leader that worship must be meaningful and relevant for the particular congregation. As she reminds the reader, “It is about engaging the soul.” What might suit a café style service in the local parish will not be suitable for a rest home service of worship. She encourages the use of participation, silence, music and visual aids. The rest of the book is a rich and varied selection of resources for use in worship, most of which are from Rosalie’s own pen. They are the fruit of her background and experience as a teacher and are tried and tested if used in the right context. There are ideas for the different seasons and festivals of the church year, time with children, themes for opening devotions, dialogues and plays, reﬂections and meditations. It is too easy these days to ‘copy and paste’ material from the internet, even reproducing whole sermons as one’s own. Rosalie reminds us that the sermon “Is the one piece of a service that cannot be taken from a book” [or the internet]. She suggests prayerful preparation and mulling over of one’s random thoughts on a passage of scripture which will help “You explore and ﬁrm up on what you believe.” This is what congregations want and need to hear. 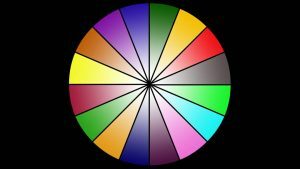 This entry was posted in Reviews and tagged Christian ministry, Christian Ministry- Pastoral Resources, Christian spirituality, liturgy, Methodist, New Zealand, Rosalie Sugrue, worship resources, worship tips on December 17, 2018 by Philip Garside. Review by John Thornley for Tui Motu Magazine. By Bill Bennett. Published by Philip Garside Publishing Ltd, 2017. “Described as an “essay”, this 65-page book provides an informal and readable introduction to rural ministry. Parts one and two cover the historical origins in Roman and Celtic religion, embedded within parish and monastic structures, moving through the Reformation and Evangelical revivals, from a post-medieval to the 18th-century industrial, to the urban world. The story comes to New Zealand in the third part, “Clash of Cultures”, which covers the missionary and settler activities of Anglican, Presbyterian, Methodist and Catholic developments. This section concludes with the treatment of Māori Missions and Pastorates and with the independent Māori ministries in partnership models which emerged later in the 20th-century. In Part Four, “Changing Patterns of Rural Ministry in the 20th- and 21st-Centuries”, the subheadings highlight the interplay of religious and secular conflicts and compromises that have been central to the story of rural ministry from the beginning. 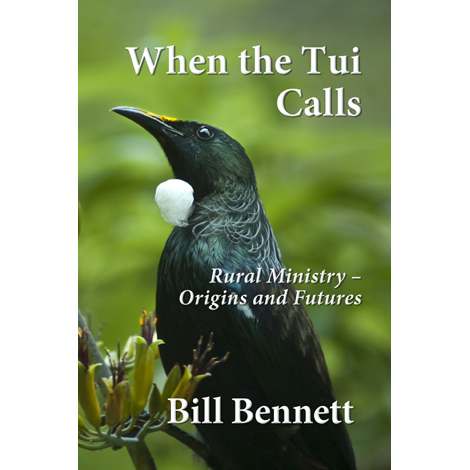 They include, “Rural Prosperity and Adversity”, “Affirming the distinctiveness of a rural ministry theology”, “Minita-a-iwi”, “The Impact of Political and Economic Changes”, “Rural Religion and Politics”, “Local Shared Ministry” and “The Near Landscape and Beyond”. Bill Bennett is the ideal writer of this book. As an Anglican Pākehā minister he has been a major mover and shaker in the development of a rural ministry theology and praxis in Aotearoa New Zealand. Much of his ministry has been in rural parishes in the Diocese of Waiapu as well as in Norwich and Lichfield Dioceses in England. His publications of prayers and hymns (both lyrics and music) are a taonga for ecumenical and bicultural worship services. This entry was posted in Author's wisdom, Reviews and tagged book review, Christian ministry, Christian Ministry- Pastoral Resources, Christian spirituality, community-facing ministry, funeral ministry, New Zealand, Pakeha Anglican, pastoral resources on September 26, 2017 by Philip Garside. Let’s pray; May the words of my mouth and the meditations of all our hearts be acceptable to you O God, our creator, redeemer and enabler. Amen. Today is Trinity Sunday. It is an opportunity to focus on our understandings of God as being one and yet also being three. Our gospel reading this morning comes right at the end of the book of Matthew. Jesus is crucified, and rises after three days. He appears to the women and tells the women to instruct the men, to go to Galilee where they will see Jesus again. The eleven remaining disciples go north to Galilee, climb a hill and Jesus appears to them as promised. Note that Jesus reappears to the women – Mary Magdalene and the other Mary – first. They are the first people to visit the tomb when the Sabbath is over. It is the women who tell the men to go back to Galilee. The women are the messengers. The writer of Matthew’s gospel also gives women prominence in the genealogy at the start of the gospel, that traces the line from Jesus back to David and then back to Abraham. Both women and men have a full part in these stories and in spreading the Good News of God’s love for us. There are eleven male disciples remaining after Judas has left. For Matthew it isn’t important to make the number back up to twelve, so his gospel has no story about appointing another disciple to take the place of Judas Iscariot. Eleven men, a small group, are enough to set the vision of the kingdom in motion. Did you note in the reading that the disciples worshipped Jesus when he re-appeared to them, but some doubted. Not just doubting Thomas who we hear about in John’s gospel, but maybe 3 or 4 others too! Don’t be too quick to judge the disciples who weren’t sure that they were seeing Jesus and whether or not they could do the things that he was asking of them. If we were there, that might have been our reaction too. And anyway, I think it is better, healthier, wiser even, to ask questions and be sure in your own mind that you are doing the right thing, before setting out on a new mission. These men had left their businesses, work, maybe wives and families, and land, to follow Jesus up to now. And that hadn’t worked out very well for them. Jesus hadn’t defeated the Romans, hadn’t overturned the Jewish political and economic authorities and powers that be, and hadn’t made their lives any easier. The disciples and the rest of the un-named people in the group that had followed Jesus, were now at a turning point. They had to make a decision: go back and pick up their old lives as best they could, or persist in working towards Jesus’ vision of a better world for all. Go back or take a step forward in faith, to a hopeful, but uncertain future. The Jewish community in Jesus’ time had many laws and rules and regulations written down in the Torah, the first five books of the Old Testament. Also known as the law of Moses. These laws are summarised in the Ten Commandments, which still provide us with useful guidelines for living today. But for every rule there is always someone who wants to find a loophole, and so the regulators, mainly the priests, had to keep refining and clarifying the laws, down to the last detail. They ended up with many different rules about what sacrifices were required at the Temple and about what activities did and didn’t constitute work on the Sabbath, and so on. I’m not entirely sure whether all Jewish people actually bothered to try to follow all these rules in their day-to-day lives. We know that the Sadducees and Pharisees groups did try to live by the rules. Probably the rest of the Jewish community would follow them as best they could. But the trouble with such detailed and nit-picking laws is that they become a burden and people lose sight of the intent of the original rules — how to live well, alongside others, in peaceful communities. Jesus was a back to basics sort of guy. He put people before rules. If someone is hungry on the Sabbath, then pluck that corn and feed them now. If he can heal someone with a withered arm now, even though it is the Sabbath, then how dare you make that person wait another day to be healed. How obscene to let his suffering continue another minute, just for the sake of a precious rule. What do we think about the Bible now? What is our attitude to it? Some Christians believe that every word in the Bible is literally true, factual and historically accurate. And furthermore, that if any part of the Bible is not true, then the whole foundation of their faith will be shaken. The Bible then becomes a rigid text, that can be interpreted in only one way. It becomes a weapon to beat those with different ideas into submission. It will not surprise you to learn that is not my attitude to the Bible, and I don’t recommend that you treat the Bible that way either. The Bible is full of foundational stories and wisdom, about people relating to God and to each other. We can reach into the depths of this book and pull out treasure for our lives today. The issue is not whether a particular story in the Bible really happened the way it is written down, whether it is true in any absolute sense, but rather what value and encouragement can we take from it today? The Bible is a beautiful and powerful thing, which needs to be treated with respect. Let’s get back to those disciples on the mountain in Galilee. What does Jesus say to encourage and persuade them, to help them move through and beyond their doubts? Let’s break that down. “Go.” Don’t stay here in a pious huddle, take that first step, start your journey. “…baptizing them” Baptism was a serious and often dangerous commitment for a follower of Jesus to undertake in the first century. It required training over several months and was often performed at Easter. The Romans persecuted and attacked Christians, so worship was often held in secret, in private houses. “in the name of the Father and of the Son and of the Holy Spirit…” Matthew’s gospel was probably written down in the 80s of the first century – about 50 years after Jesus died. My theological reading suggests that the concept of the Trinity – Father, Son & Holy Spirit – probably wasn’t known to Jesus, but was developed later by the early church. Jesus came to be known as Jesus the Messiah, or Jesus the Christ, but I think these are terms that were applied to him by his followers long after his death, as they struggled to come to terms with his crucifixion and started to build a new theology that would serve the developing Christian church. The Council of Nicea in the year 325 was still arguing over the fine points of how Jesus could be both human and also divine. Jesus key vision was always of a just society, where everyone had enough – of the kingdom of heaven, here on earth. “and teaching them to obey everything that I have commanded you.” What did Jesus command his disciples to do? Actually, his instructions were quite simple: Love God, Love your neighbour, Love yourself. That is the sum total of Jesus’ law. There are no loopholes to sneak out through. Either our lives meet these simple standards or they don’t. Third: “And remember, I am with you always, to the end of the age.” This is harder to interpret. In what way was Jesus with the disciples after he died and rose? How is Jesus with us here today, how do we know? When does the age finish? Does it ever finish? I find the usual descriptions of the Trinity, of God being Three in One, as Father, Son and Holy Spirit, a bit distant. The modern usage of Creator, Redeemer and Enabler is more appealing, but I have come up with my own description. Worship God, Follow Jesus, Spirit Filled. To me this has an implied movement, freedom of action and purpose. It is not a static theory. We here this morning are worshipping God. (Remember, I’m just up here leading and guiding you, I am not the focus.) If we worship God, we are saved from worshipping possessions or worldly power. And God is found through the week in our everyday lives, in beautiful unexpected sights or interactions with other people. When we keep still and listen, God is with us. I find it helpful to make a distinction between Jesus the man who was born and lived on this earth and died just like us, and Jesus the Messiah or Christ of faith. We can then focus on what the Bible tells us Jesus the man said and did, and try to do the same. We will fail as often as we succeed, but we need to keep doing and saying the things that Jesus’ example showed us. I see Spirit as Energy. The Spirit is that flash of inspiration and second wind that we get when we have run dry. Spirit is freedom. Spirit is power. Spirit is light and music. Spirit is the good in you and the good in me. If we are filled with the Spirit, we also recognise the Spirit at work in other people. Pala explained to me recently that the greeting and action of Namaste [demonstrate] is more than just a polite greeting. It has a deeper spiritual significance and conveys the meaning: The Divine in me bows to the Divine in you. Isn’t that beautiful! Namaste. Step out in faith, encouraged by Jesus’ message and example, and recognise the good in others. This entry was posted in Worship & Music and tagged Christian inspirational, Christian Ministry- Pastoral Resources, Christian spirituality, community-facing ministry, liturgy, Methodist, New Zealand, theology, worship resources on June 24, 2017 by Philip Garside. “In this book’s opening pages the author states clearly her intent in writing this resource, which is nothing less than naming what she calls the elephant in the room no one wants to name, and especially no one within religious institutions. The naming of this ongoing reality is exactly what this author does. She claims quite rightly that no religious institution is devoid of the need to deal justly and compassionately with both ‘victim’ and ‘abuser’ when incidences of adult sexual abuse are brought to light and faced up to. I deliberately choose to juxtapose these two words – ‘justly’ and ‘compassionately’ – as this is the approach the author takes in this valuable resource written out of personal experience. The subtitle of the book – Faith Seeks Understanding – captures accurately what this book sets out to accomplish and I believe achieves in a most succinct, readable, and informative manner. As such, this book will be a valuable resource for all manner of people both inside and outside of religious institutions. The author conveys well the complex issues that frame instances of sexual abuse. 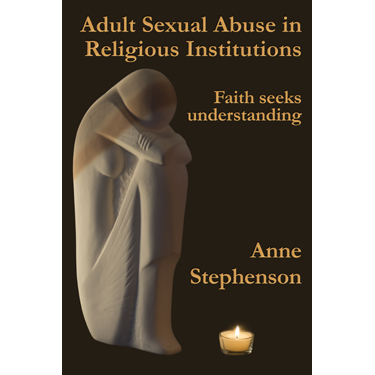 She helpfully identifies some of the key warning indicators along with some of the key psychological frames of reference that we need to understand to grasp the full extent of adult sexual abuse and particularly how and why it occurs within the context of religious institutions. It is fair to say that all religious institutions have needed an urgent wake-up call to become aware of the realities of adult sexual abuse by its spiritual leaders. This crisis and the way it has been addressed have proven to be very impetuous. In many cases there is a need to both address and establish far more robust procedures that work towards ensuring the pastoral and ethical accountability of those in key positions of trust and influence. The language used by the author of ‘offender’ and ‘victim’ are rightfully used throughout the book to clearly identify and then address what is at heart an abuse of power which breaches the all-important ethical principle of ‘fiduciary duty’. As the author establishes, within religious institutions this amounts to breaking the sacred trust between the leader (the one with power) and the congregant who has deemed the leader to be trustworthy. Because of this sacred trust the consequences are life- changing and the healing required is immense and of a specialised nature both for the victim and offender. The author conveys well the full extent of both the abuse and the healing journey required. This entry was posted in Reviews and tagged Christian Ministry- Pastoral Resources, lament, Methodist, New Zealand on February 24, 2017 by Philip Garside. This sermon reflection explores two visual concepts to help us think about choosing to name others as enemies or as neighbours. I preached it at Wesley Church in Wellington, New Zealand on 11 Sept. 2016, the 15th anniversary of 9/11. The full text of the reflection is shown below after the video. Reflection: Who is my enemy? Let’s pray: May the words of my mouth and the meditations of all our hearts, be acceptable to you, O God, Amen. The ideal of loving God and loving your neighbour was not new in Jesus’ time. In Leviticus 19:18 we are told “Don’t seek revenge or carry a grudge against any of your people. Love your neighbour as yourself.” The ten commandments given to Moses are rules about living harmoniously in community with our neighbours. So these ideas had been part of the Jewish tradition for many centuries before Jesus. You have heard that it was said, “An eye for an eye and a tooth for a tooth.” But I say to you, Do not resist an evildoer. But if anyone strikes you on the right cheek, turn the other also; and if anyone wants to sue you and take your coat, give your cloak as well; and if anyone forces you to go one mile, go also the second mile. You have heard that it was said, “You shall love your neighbour and hate your enemy.” But I say to you, Love your enemies and pray for those who persecute you, so that you may be children of your Father in heaven; for he makes his sun rise on the evil and on the good, and sends rain on the righteous and on the unrighteous. Jesus adds to the commandments to love God and neighbour, the challenge to also love your enemies. Here is a paradox: If you can learn to love your enemy, can they still be your enemy? Two things have brought this question into focus for me. I have been reading Jewish academic Amy-Jill Levine’s book “Short Stories by Jesus: The enigmatic Parables of a controversial Rabbi.” She has lots of stimulating ideas about how to interpret Jesus’ parables, as they have come down to us in the Gospels, in modern translations of the Bible. In her comments on the Good Samaritan story, in which the lawyer asks, Who is my neighbour, Levine says something remarkable. It relates to how Hebrew is written down. In the formal written Hebrew used in handwritten scrolls of scripture, only the consonants are printed. The person reading the text has to mentally add in the appropriate vowels, based on the context of the rest of the sentence. Let me demonstrate in English with the consonants T L L.
So on the page these two consonants can stand for two opposite ideas. (Sorry I can’t pronounce the Hebrew words.) But can you see the challenge here? You or I reading the text have to decide whether it means enemy or neighbour based on the context. The meaning is not fixed, but flexible. Taking this idea one step further, if we can choose to interpret the same text two different ways, can we also choose whether to consider another person as a neighbour or an enemy? I think we can. Today is the 15th anniversary of the event that Americans call 9/11. After the twin towers of the World Trade Centre in New York were destroyed, people in the United States flew flags from their houses and many started going back to church again. In the face of an identifiable enemy and threat, they united behind traditional symbols of meaning and togetherness. The government response was to seek revenge by going to war in Afghanistan and Iraq. Horrifying wars, which have led directly to many of the conflicts we see today in the Middle East. The prophesy from Jeremiah we heard this morning brings to mind the devastation to people, and to the land itself, that war causes. It is a warning to follow the ideals of loving God and neighbour, or face catastrophe. Many odd things happened on 9/11. There is a lot of speculation about what really happened and why? What is clear is that people in the United States identified themselves as us the good guys under attack from them, the enemy. That’s where the trouble starts, by identifying and naming someone else as different, as other, rather than looking for the things we have in common. How can we discover what we have in common with another person? I find social occasions with lots of people making small talk very difficult. What works for me is to find one person to talk to and by listening carefully to what they are saying, find a topic that is important to them to talk about. Then I can contribute my ideas and experiences and we get to know each other a little. The second thing I want to share with you is a visual idea I have been mulling over since February. Religious beliefs can divide or unite people. Imagine for a moment that this segment represents Methodists. The darker shades at the top of the segment are where we find the sacred texts, rituals and traditions that we hold onto most firmly. John Wesley’s sermons, Charles Wesley’s hymns, an open communion table and a concern for social justice. These are things which Methodists identify with. Lets say that the next segment represents Catholics. The darker shades at the top of the segment represent devotion to the Pope, rosary beads, regular confession – the things that Catholics hold dear. Lets say the next segment represents Islamic faith. The darker shades towards the outside of the segment represent a belief in the prophet Mohammed, the Koran, pilgrimage to Mecca and the other things that Moslems hold dear. Now lets complete the circle with other faiths. 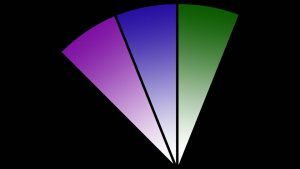 Note the black lines separating the segments. They symbolise the divisions between people of faith. These divisions can lead to intolerance and conflict. Taken to extremes they can lead to violence and war. I imagine this as a journey into the darkness, which swallows up all the good things about faith and leads to oblivion. What if instead we look inwards to the centre of the wheel, towards those things which we have in common with other people and other faiths. And let’s remove the borders between us. Now as we journey towards the light at the centre, we are free to sample the ideas and ideals of other faiths and discover the things we have in common. Loving God (or Gods) and loving neighbour are universal ideas, shared by people of faith. And what if the Holy Spirit blows and the circle rotates, pivoting around the light in the centre and blurring the distinctions between us? Is world peace really that easy? No, but Jesus pointed us in the right direction. In the Good Samaritan story the lawyer wants an easy, tick the box answer to eternal life. Instead Jesus tells him to love his neighbour, a lifelong commitment. So the lawyer asks, OK who is my neighbour? and gets an unpalatable answer. Your enemy, the Samaritan, is your neighbour too. Jesus’ wisdom that we should love our enemy still challenges us profoundly today. If you can learn to love your enemy, can they still be your enemy? No, because of your change of heart, they are now your neighbour. 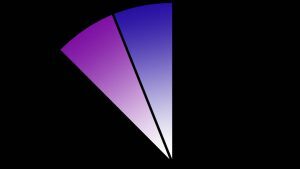 This entry was posted in Worship & Music and tagged attitudes to other people, Christian Ministry- Pastoral Resources, enemy, neighbor, neighbour, New Zealand, worship resources on September 16, 2016 by Philip Garside. “This wise and wonderfully comprehensive book … will benefit many who carry pastoral responsibilities” Review by Anne Priestley of Earthed in Hope. “A quick scan of death notices in a newspaper reveals the fading influence of Christian faith in this country. Many funerals now are held at a crematorium or a funeral director’s chapel. Some of these funerals will be taken by a minister of religion; but increasingly funeral directors and celebrants have taken over the traditional roles of a minister of the church. We live in a world where there are multiple views on “what comes next” after death, mostly at variance with the theological witness of scripture. Even church funerals often celebrate the life which has ended, rather than proclaiming Christian hope in the midst of grief and death. This is the terrain surveyed by Hendery, a Pakeha Anglican priest. His writing is marked deeply by his trust and hope in God’s grace and equally by his long pastoral experience. He begins with sociology and theology, chapters which are most lively when earthed in contemporary New Zealand practice. The second half of this book has a strong practical bent, as Hendery discusses pastoral and liturgical issues in journeying with the dying person and in the stages before, during and after the funeral service. He includes thoughtful commentary on the rich resources of A New Zealand Prayer Book /He Karakia Mihinare o Aotearoa, the Anglican prayer book (this material, valuable for Anglican ministers, will be less useful to others). Here, as elsewhere, he provides ideas from a wide range of religious and cultural sources. Hendery pays attention to the complexities arising from a death by suicide and to special questions concerning children and death. He is not afraid to criticise the Church for less than helpful theology and practice, both past and present. Hendery’s theological commitments and generous pastoral instincts stand in unresolved tension — the tension of God beyond and God within. For me, this reflects a great challenge of funeral ministry: how to speak the language of the bereaved, in our changed and changing world, and also to proclaim faithfully the good news of God. I also appreciated Hendery’s determination to be blunt. To say the words “die”, “death”, “coffin”. To face the fact of one’s own death. To accept that, facing death, we do not know everything. This entry was posted in Reviews and tagged #EarthedInHope, Christian Life - Death Grief Bereavement, Christian ministry, Christian Ministry- Pastoral Resources, funeral ministry, New Zealand, Pakeha Anglican on February 17, 2016 by Philip Garside. “Church leaders and lay alike will find humble but passionate vision and wisdom here.” Review by Rosemary Dewerse of Weaving, Networking and Taking Flight. (Wellington: Philip Garside, 2014), 68pp. Rosemary Dewerse, Mission Educator, College of St John the Evangelist, Auckland. “In our part of the world where practitioners significantly outnumber academics in the field of missiology, we often do not benefit from their wisdom because they are too busy “doing.” This is especially the case with Pacifica leaders. In this remarkable little book Rev Ngahe, a Tongan Methodist minister working in Auckland, New Zealand, does, however, take the time to pause and record his ministry strategy across 2006-2014, a strategy that because of its deeply contextual and outward-facing commitment exemplifies missional church leadership. Ngahe’s strategy is straightforward. He seeks out visual images that can capture his own but also his people’s imagination and then explores their riches as he leads his community in building connections within and beyond their own boundaries in service of Christ and the people. For himself as a Tongan the image of a Fala (a mat woven by one’s family) keeps him humble in reminding him that when he joins a community he joins a history and comes to contribute to that. It keeps him open as a Fala’s purpose is to invite family and others into talanoa (conversation seeking agreed solutions). It also keeps him mindful that when he moves on it is good for the people to be continuing to weave a closely interlaced Fala. When Ngahe arrived in Avondale, Auckland, in 2006 he found the local icon of the Avondale spider. This got him thinking about the care with which a spider (in his imagination, God) weaves a web that despite the weather holds fast. The legs of the spider he saw as us all doing God’s work in reaching out across the community web through good and difficult times. Such thinking saw him lead the renewal of a rundown church building by seeking and welcoming help offered by likely as well as unlikely groups (eg the NZ Methodist Church, local businesses, the Mormons, the Department of Corrections). The congregation had a vision of being ‘Christ’s light to the community’ by running a homework club as a way to begin reversing endemic unemployment in the area; it was a vision others wanted to support, though there was some discomfort at first amongst parishioners with some of their partners. Though Ngahe left in 2010, the club, and other community activities, continue to this day in the refurbished church. In Manurewa the image drawn upon was the name of the suburb: in Maori it means “soaring bird.” There, as Ngahe notes, “the listening and storytelling took pictorial shape” (p26). A mural on this corner church was painted with the help of local businesses, community police, local graffiti taggers, and MPs, as well as church members. They and nearly 40 other community groups now see “The Corner of Hope” (the name of the Church) as a place of welcome and belonging for all people. Hospitality and transformation are the two key theological themes underpinning all that happens there. This entry was posted in Reviews and tagged Christian Ministry- Pastoral Resources, community-facing ministry, Methodist, New Zealand on October 15, 2015 by Philip Garside. Published by Philip Garside Publishing Ltd, Wellington, 2014. “The book is the study-leave report of a Tongan Methodist Pastor. He reflects on nine years of ministry in two parishes in the Auckland area. It is extremely well written, thoughtful and engaging. I found Vaitu’ulala Ngahe’s writing style fresh and alive. Sometimes a sentence would leap off the page with vigour and impact. Vaitu’ulala’s metaphors are lively and his descriptions and thinking are clear. Vaitu’ulala began his reflections with three symbols or icons. He builds his theological reflection and his narrative around the mat or Tongan fala, the spider and the bird, which all opened up metaphors for exploring his ministry. The mat, crafted by the family and spread out for family discussions, with its unfinished edges always open to new weaving was a great metaphor for Vaitu’ulala’s ministry practice. Vaitu’ulala found his other symbols in the places of his two ministries, Avondale and Manurewa. Avondale Town Centre hosts an icon of the Avondale Spider and Manurewa means “soaring birds”. Vaitu’ulala’s ministry and reflections are deeply grounded among the people of these places. Vaitu’ulala reflects on the processes undertaken in Avondale and Manurewa to revitalise community relationships and begin new outreach programmes. His writing would spark reflection for parish leadership and offers examples of how to undertake such reflection and how valuable it can be. Vaitu’ulala also includes practical insights into practices for leading transformation in parish ministry and community outreach. I would recommend this book to any pastor considering study-leave or planning a period of reflection before transition in ministry. I would also strongly recommend it as good reading for the leaders of parishes who are considering changing how they relate with their local communities. It would also be helpful to those feeling stuck or complacent in their parish life. This entry was posted in Reviews and tagged Christian Ministry- Pastoral Resources, Methodist, New Zealand, Tongan on August 12, 2015 by Philip Garside. “When Rev Vaitu’ulala Ngahe’s hands come together in prayer, I imagine big strong hands that comfort the lonely and the sick. I imagine hands that direct public service and selfless giving to others. I imagine hands that build furniture, till soil to build gardens and wield paint brushes to beautify public places. 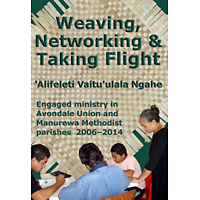 The central theme of Weaving, Networking and Taking Flight is a contemporary perspective of Godly public service, the principle of applying a theological perspective to communities within Aotearoa New Zealand. It is an inspiring narrative of service that provides an insight into the progressive perspective of the Methodist Church of New Zealand. Rev Vai puts at the heart of his journey an understanding that ministry is intrinsically linked to human need. The narrative of the book communicates his concern for social justice and human happiness, which goes hand and hand with ministry teachings and spiritual nourishment. The book is a story of collective advocacy. Rev Vai is a sophisticated thinker. His days in Avondale and more recently in Manurewa reveal his appreciation of networking, building relationships, forming alliances, working collaboratively and communicating his message of service to others through multiple mediums. The narrative is reflective. Rev Vai offers an insight into nine years of ministry and the importance of building healthy and hopeful communities. He reflects upon a holistic notion of health and hope, which requires an equal attention to the spiritual, physical, emotional and cultural well-being of the whole community. He ties this reflection back to Christ’s transformative work among the people and communities of his day. The connection between the selfless giving of Christ and the transformative work of contemporary Christians has not changed through the generations. To this end Rev Vai provides an insight into how service can and should be offered to those around us. It is a lesson for all of us, not just those who minister and tend to our spiritual needs. The book tells the story of three people who tagged buildings. Those people asked Rev Vai if they could join the church community, to which he replied that they were more than welcome to come. It is through this process of reconciliation that Rev Vai led a renaissance within the hearts of those people, as well as some initially ambivalent members of the wider church community. Rev Vai asks the church to live out its theology of hospitality, a challenge that demands a leap of faith. He invites people with complex lives and challenging histories to become equal partners in the house of the Lord. The Manurewa Methodist Church is located on ‘the corner of hope.’ Through his work Rev Vai encourages people to throw open its doors to all; no one is declined the opportunity to enter under its roof. Weaving, Networking and Taking Flight is a story of one man’s journey. It is a blueprint for service that provides an insight into ecumenical leadership in the context of communities in south and west Auckland. From the days of the early missions to this land, from the early Wesleyan missionaries at Mangungu, at Kawhia, Manukau, Kaipara and Raglan, the Methodist Church of New Zealand has always placed great currency on the bi-cultural foundation of Aotearoa New Zealand. Methodist teachings acknowledge the foundational role of Te Tiriti o Waitangi, the importance of personal virtue, the value of sobriety, equality, and peace. Weaving, Networking and Taking Flight contextualises these principles in the modern world. It is a story of inspired service. 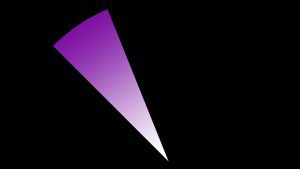 This entry was posted in Reviews and tagged Avondale, Christian Ministry- Pastoral Resources, community-facing ministry, Manurewa, Methodist, New Zealand on June 23, 2015 by Philip Garside. What should we be offering to Kiwis dealing with death? Lloyd Ashton asked Alister Hendery what should we be offering to Kiwis dealing with death. 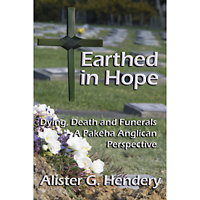 Alister Hendery’s new book Earthed in Hope – Dying, Death and Funerals, a Pakeha Anglican Perspective was launched in Wellington last November. It is the fruit of a life that has specialised in death. Over the course of 35 years in ministry, Alister has taken more than 1500 funerals – both as a priest and celebrant. 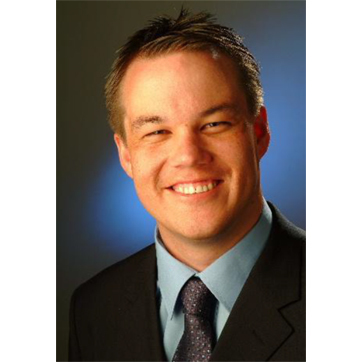 He has also worked as a counsellor specialising in grief and loss. Death is even a feature of Alister’s chosen sport. A few years ago he took up powerlifting. The demands of wrestling with a loaded Olympic bar saw him through the more intense periods of writing his book, he says. “I’m often asked,” he says, “whether I find such a concentration on death depressing. If appearances are anything to go by, that’s not mere talk, either. Because Alister Hendery has an impish grin, a twinkle in his eye, and a ready wit. Alister decided to write his book because he was appalled by the “acute lack of any serious writing about funeral ministry” in New Zealand. He wanted to do something about that, to offer resources for funeral ministry – but also to kick-start conversations about death and bereavement. Because death, he says is a subject we don’t talk about nearly enough. It has been marginalised, even in the church. “I go to Anglican funerals,” he says, “where the word ‘death’ is not used. “The church has been seduced by a societal obsession with the beauty of youth. That lack of deliberate reflection about death and dying is all the more serious, he says, because the Kiwi Zeitgeist has changed. While the church has moved inexorably from the centre to the periphery of our culture, he says we haven’t seen the opportunity that lies at our feet. “2016 marks the beginning of the demise of the baby boomer generation. We haven’t grasped, says Alister, that funeral ministry is “at the edge of our connection with society. “It’s the place where the gospel and contemporary culture most keenly interact. Alister began research for his book in 2010. Within a year, Pike River and the first of the Christchurch quakes had happened. “Suddenly, with Pike River, you had what one commentator described as the first expression of public grieving on the social networks. “I was able to download literally thousands of postings, and a picture very quickly emerged. “And I can tell you that neo-Platonism, the belief in an immortal soul, is alive and well. People are reverting to ancient images of the ferryman crossing the Styx. In the wake of Pike River, Alister got tired of hearing the word closure being bandied around. “But human being just don’t work like that. Grief is a time of utter chaos. And we each grieve uniquely. It can’t be stylised in the form that the media present it. “You never find closure to grief. “It is always a part of you. “We look for change. Radical change. “I was watching a movie on day, and suddenly my eyes filled with tears. And it was a grief 30 years old. “It was almost as though it had tapped me on the shoulder and said: ‘Just pay attention’. Alister is not picking a fight with celebrants. After all, he’s been one himself. “The church could learn from good celebrants,” he says, “about personalising and expressing the uniqueness of this death. “What celebrants can’t do, is draw on the richness of the church’s tradition. And the strength of hope that we have, as we look beyond this death. The celebrant funeral, he says “is often almost entirely retrospective. We acknowledge the retrospective – but we say there is a prospective dimension. There is a hope. Alister Hendery was ordained in 1980. “One day this will be me. “One day, I shall not walk away from this place. 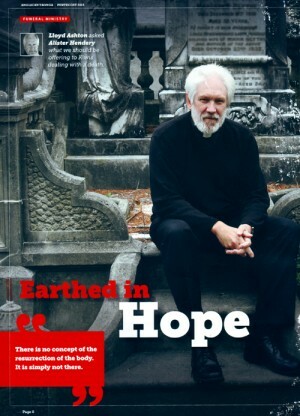 This entry was posted in Reviews and tagged #EarthedInHope, Christian Life - Death Grief Bereavement, Christian Ministry- Pastoral Resources, funeral ministry, New Zealand, Pakeha Anglican, pastoral resources on June 20, 2015 by Philip Garside. 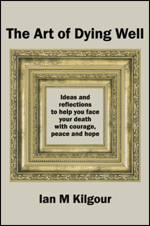 Ideas and reflections to help you face your death with courage, peace and hope. Philip Garside Publishing Ltd (2019). eBooks (PDF, Kindle, ePub) $10.00.